Sometimes you just want to eat S’mores without all the hassle of going on a camping trip. Am I right or am I right? Well, when that S’mores craving comes over you and you are nowhere near a campfire, here is your solution: S’mores Bars. These are kind of like making Rice Krispies treats, except you use Golden Grahams cereal. And chocolate, of course! These S’mores bars are an easy no-bake dessert. I used milk chocolate chips, but if you prefer semisweet chocolate chips, go ahead and use them – they will taste great either way. Grease a 13×9 inch baking dish. Measure out 6 cups Golden Grahams cereal into a large bowl and set aside. In a large saucepan, melt butter, vanilla, light Karo syrup, chocolate chips and 5 cups mini marshmallows on low heat, stirring constantly. Once marshmallow/chocolate mixture is completely melted, pour mixture over Golden Grahams cereal and stir until the cereal is evenly coated. Stir in 1-2 cups of mini marshmallows. I like a lot of marshmallows in mine, so I added about 2 cups! Press mixture evenly into the 13×9 inch pan. Allow to cool for one hour until set. Cut into bars. Store at room temperature in an airtight container. Click to download a printable version of this Smores Bars Recipe. If you love toasting marshmallows for s’mores, but don’t have a campfire handy, check out my other blog post for how to make a Tabletop Fire Bowl. It’s easy and a fun way to do outdoor s’mores on the patio table. 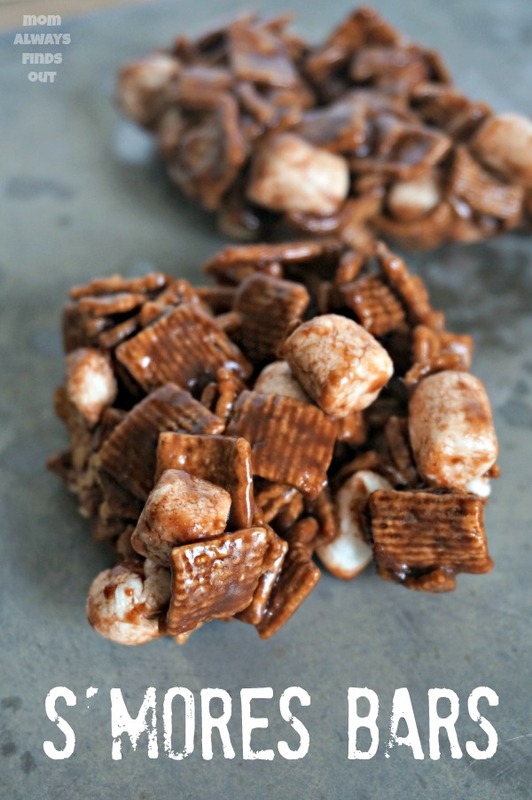 Are you a S’mores fan? When was the last time you made S’mores over a fire? Let me know what you think about these S’mores bars, especially if you make them at home. that sounds delicious! I have been craving some s’mores lately….. Please, sir, can I have s’more?